Glückstadt: The name translates “Fortune-City” and stands for itself. 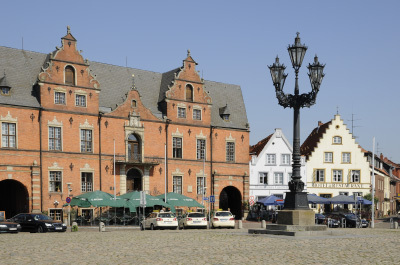 Located directly at the Elbe River, the city profits of the beneficial position. It is a true tourist magnet for German and international visitors. It ties life close to the water to a typical German village aura, which tourists really appreciate about Germany. 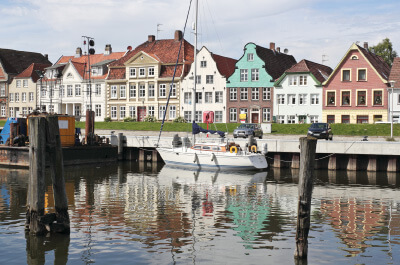 The well-known North Sea is only a stone’s throw away – this makes it possible to discover the fresh breeze of the sea even in Glückstadt. The royal background of Glückstadt started over 400 years ago: King Christian IV founded the city on March 22, 1617. He was the one who coined the name. The king wanted to build an invulnerable fortress city located at a port – much like Hamburg back in the days. New citizens were drawn to the city by many promises. One of them was the freedom of religion. The hexagonal foundation walls of the former fortress can still be seen in aerial photographs today. These walls even largely survived the Thirty Year’s War. The city hall is located directly at the market – in the center of the city. Here, you can enjoy the unique flair of the impressive houses. You can also find the first church of the city there, which was built in 1618. It is known for its church spire: The Danish king’s crown and the goddess Fortuna can be seen on top. The Marktfleth, a little channel or dyke, is located south of the marketplace. A “fleth” or “fleet” is the term that was once used to describe natural streams that belong to the Elbe River. In the Middle Ages the German term “Marschen” was introduced for it. In previous days the channel was used as an inland port, but was buried in 1956. However, it was artificially reconstructed in the 80s. The royal printing house: Even today papers are still printed here. The Glückstädter Fortuna was Schleswig-Holstein’s first paper starting in 1740. The Wiebke-Kruse tower and the Traufenhaus: Both are sights of the city. However, they can only be admired from the outside, as they are privately owned. The Detlefsen Museum: You can find it in the Brockdorff-Palais – a manor house. 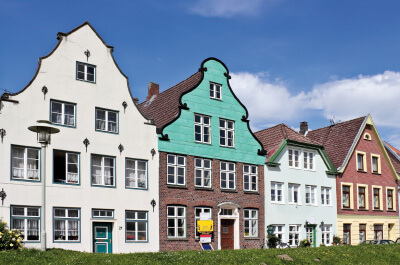 Here, you can discover the city archive with multiple mementos covering the history of Glückstadt. The Restaurant “Zur alten Mühle” is located directly at the inland port. Discover the city and visit us for a nice piece of homemade cake afterwards. While enjoying the taste of it, you can relax on our terrace and look over the inland port. You can watch the sailors and colorful boats from our terrace. The barrage is opened from time to time dependent on the tide. Moreover, you will find the Palais for contemporary art at the port: The building was built in the 17th century and houses plenty of artworks of contemporary style. 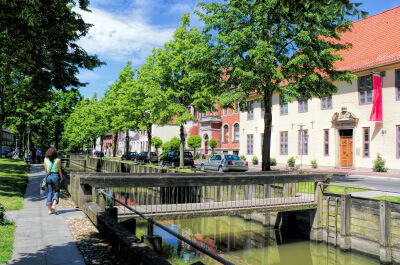 Discover Glückstadt’s history via foot while going for a walk. You will find numerous monuments there, which wake thoughts about long-gone times. 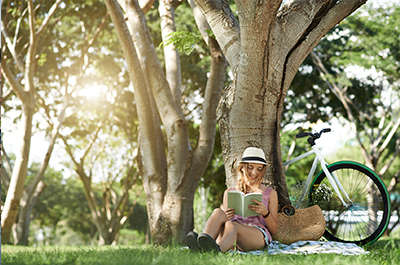 Furthermore, the park offers enough space for recreational activities on sunny days with its shady spaces and high trees. The former city fortification was turned into a municipal park after the siege of Napoleon’s troops had ended. Johan Ernst Seidel, who was the city’s president at that time, led the reconstruction. The summer can get hot – even in the North. He to August. 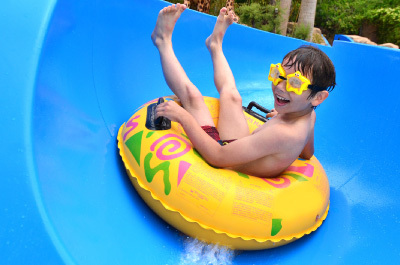 Visitors will find a huge slide for family fun and multiple Jacuzzi beds for plenty of relaxation opportunities. The public pool is located at the west end of the channel – you can get there in under ten minutes via foot starting at our restaurant. Browsing around in many little shops: a typical activity on a trip – doesn’t matter if it’s a short trip or a long vacation. You will find the pedestrian outdoor mall close to the marketplace, called “Große Kremper Straße”. Here you can discover multiple little stores that are mostly owner-managed. Personal customer service is taken for granted. Maybe you will find a souvenir to take home. That way you will always have a little piece that will remind you of your trip to Glückstadt.